When you sit down to your writing session, do you jump right in and start typing furiously? Or do you sit down, check emails, check Facebook, send a few tweets, visit a couple blogs, then get up to make a snack, clean your desk, then sit back down only to repeat the process of checking emails, Facebook, Twitter until you realize you’ve lost all of your writing time? When it’s something tough, like opening a vein and writing, I can be a super duper procrastinator. (Wendy did a great post HERE for all us procrastinators and we have lots of posts on organizing your time and improving production levels!) Part of the problem for me is getting into the right mindset to be able to get the words out. It’s often hard to leave the real world behind and enter the writing zone. I decided to begin a pre-writing ritual to bring my focus in faster, rather than procrastinating online or by cleaning my office or any of those other things that keep us from getting in the mindset for writing. 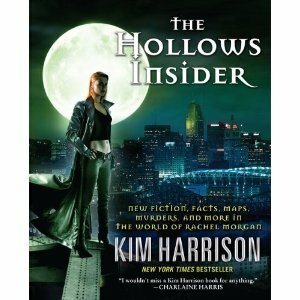 One thing I’ve started doing is picking up Kim Harrison’s The Hollows Insider I received at Christmas. It’s a companion book to Harrison’s long running series. “The Hollows Insider is the Hollows world guide, the definitive source for all things Hollows, with spells, character descriptions, species descriptions, interoffice memos, murder and mayhem.” I absolutely love it and gets my head in the “write” mindset. This is what I want, this is what I am writing, a fun urban fantasy. I would love to follow in Harrison’s footsteps and write a long running series, with short stories, graphic novels and a companion book that fans will love. I read a few pages (because it’s the kind of book you can do that with) and it not only brings my focus to where it should be, it also lights a fire of motivation in me to get working. The second thing I do is send an email to a friend in the writing world, just to say “hi, how is your writing going?” It makes me feel great to reach out to friends in the community and is a way of giving myself permission to let go of the real world and to devote my time to writing. Not that I think all my writing friends don’t live in the real world, but you get my meaning. It doesn’t take a lot of time and is a quick way to tell myself my friends are writing, I am a writer, I must also write. An extra bonus is I can read replies on a writing break or before my next writing session. When Christie starts a new story, she says she opens “three or four instances of Notepad, which for some reason feels less permanent than Word. ” She then writes a different story opening in each, picks the best one and deletes the rest. She then comes up with a list of words she wants to use “to evoke the right feel for the story. “ Isn’t that a great idea? It could apply after you’ve started the story as well. If you’re writing a short story or a novel, there will be certain words that reflect the themes, tone or style of what you’re writing. Reviewing those before writing would be an excellent way to zoom your brain right to the heart of the matter. John has a an inspiration board that he spends time reflecting on before writing. It contains his “Clarion acceptance letter and pictures of Neil Gaiman and a sheet of paper with encouragement and autographs from many of [his] author-heroes.” Beneath his board he also has a creative altar space with his “Daruma goal-dolls (a Japanese tradition), a pair of brass goggles, and little gifts and cards” from his friends and family. Isn’t that a fantastic idea? I am going to do this too. Combining writing with getting to be crafty is right up my alley. I hope that I can condition myself to sit and write on cue. Right now, it takes a bit of encouragement. The important thing is, to find what works for you. Ladies and Gentlemen, start your writing engines! What do you do to get your head in the game? *Awesome* post Sandra! What a great glimpse at inkpunk creative rituals. Along the lines of your own letter writing ritual: I LOVE IT. As the recipient of a per-writing email (yay!) can I just say how inspiring that is? I get a dose of “getting ready to write” creative mojo, inspiring me in my own work! I’ve started following your example in this. I struggle w/ the pull between staying connected vs productivity; Opening twitter or FB puts me at risk for loosing significant chunks of time. An email here and there helps me to alleviate the loneliness while keeping a better handle on time management. At work I keep a Notepad file to use as a commonplace book, so I can scratch ideas in between tasks (and, uh, instead of them, NOT THAT I WOULD DO SUCH A THING AT WORK). At home, I hung a framed photograph of Robert E. Howard, with whom (with which?) I have a seething rivalry. He glares. I glare. He condemns me with his eyes. I make fun of him for not being alive anymore, and get to work.